Marnell Corrao, a global architectural firm, specializing in entertainment properties, required a sophisticated look and feel to reflect their position in the industry. Utilizing Flash (a relatively new technology in 2000), GS Design captured the firm’s unique and highly successful approach to construction. Leveraging my commercial building expertise gained while with Johnson Controls, I proposed adding a Portfolio section giving users Marnell Corrao project snapshots. Additionally, GS Design developed a CMS for News, Career and Portfolio sections. 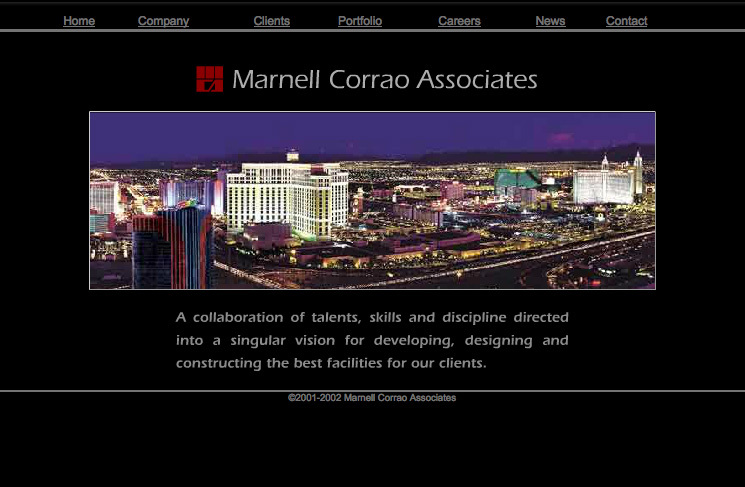 Today, the Marnell Corrao site is still visually stunning and easily navigable. And, the Portfolio section….still there. Sometimes, good content never goes out of style.